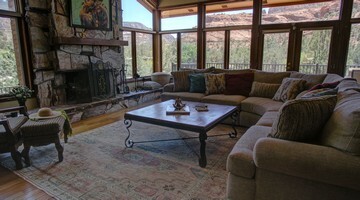 Enjoy expansive red rock views from inside and out from this perched up-high spacious four-bedroom retreat home. 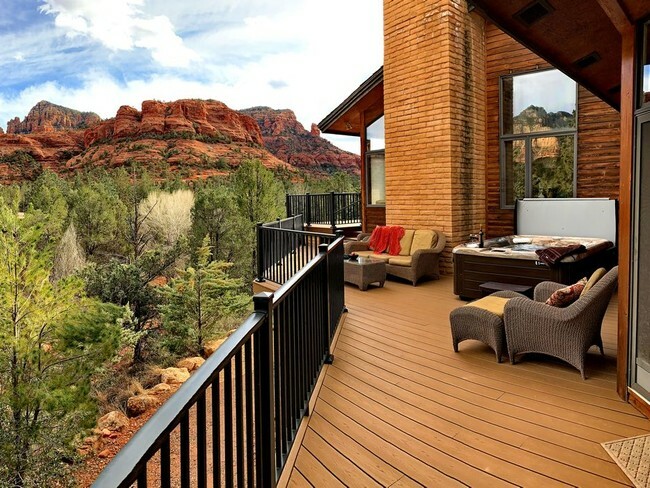 This Sedona vacation getaway home is ideally located within minutes from trails and offers perfect accommodations for a couple or a family of eight. If enjoying an outstanding view is high on your list, check out Broken Arrow Retreat, a four-bedroom home situated on its own Sedona hillside overlooking up-close red rock megaliths and a super vista of the Mogollon Rim. The main living space of this large home is bright and open with floor to ceiling windows providing superb views from its many comfortable places to sit. A focal point of the living room is a beautiful wood burning fireplace for added ambiance. From the extra-large gourmet kitchen with it’s Wolf dual fuel range and added amenities, to the huge master bedroom suite which includes its own sitting area with a wood burning fireplace, full bathroom with large soaking tub and access to the comfortable seating on the deck, Broken Arrow Retreat offers the special touches many are seeking in their Sedona vacation accommodations. The main floor is upstairs and includes all but the second bedroom suite which is on another level and the billiards room which is downstairs off the garage. The outdoor spaces include a wrap around 1,200 square foot deck which offers a comfortable sitting area, dining table and a Weber barbecue grill, all with easy access from the kitchen, living room and master bedroom. There is also an enclosed area for doggie family members to hang out, too. Near to all the Sedona area has to offer, Broken Arrow is just a five-minute walk from the very popular Broken Arrow trailhead and a short drive to many other trails, restaurants, galleries, and shopping. Broken Arrow Retreat is away from the lights of town and offers impressive dark skies for outstanding views for night time star gazing. Whether you are visiting alone, having a couple's retreat or making a getaway with the girls or the whole family, Broken Arrow Retreat provides ideal accommodations for up to eight, with four bedrooms and three full baths. Canine family members are also welcome. 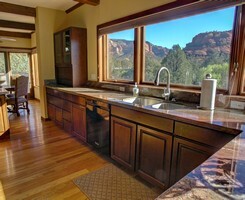 A truly unique Sedona experience will be enjoyed by all at Broken Arrow Retreat! !